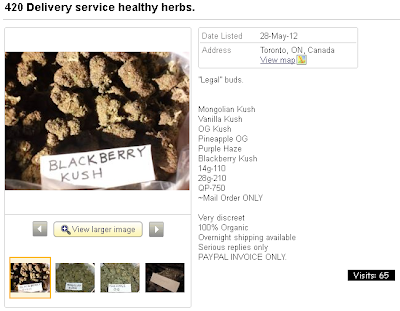 Disclosure: Yes, I tipped Kijiji off about this ad and yes, they erased it. It's not about the weed...it's about the rules. Dude had a ton of other ads, though. Is he selling stolen gear? I would not dare make that assertion. Does the gear come with a manual or a box or charger? Well, I dunno about THAT. That's his business. Anyway, if you want to sell weed, do it the right way: That is, not on Kijiji through Paypal.